The U.S. 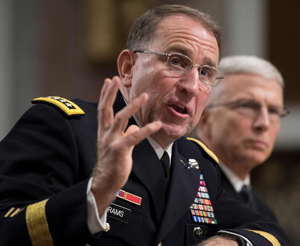 Forces Korea will stay here until a peace treaty is concluded with North Korea, their commander Gen. Robert Abrams said on Tuesday. They will stay "until there is a peace treaty, because we still remain in a state of armistice, a cessation of hostilities, until such time that there is a peace treaty between all of the parties," Abrams told the U.S. Senate Committee on Armed Services. The remarks seem to contradict the official position of Seoul and Washington that the presence of the USFK is a completely separate matter from any peace treaty that might replace the armistice that halted the 1950-53 Korean War. But U.S. President Donald Trump has frequently mooted the possibility of U.S. troop withdrawal from South Korea, mainly because of the cost. Only two days after the two allies last week agreed to an 8.2 percent increase of Seoul's share of the USFK's upkeep costs this year, Trump complained, "It's got to go up." "President Moon Jae-in has said several times that a peace treaty is one thing and the presence of the USFK is another. U.S. troops will continue to stay here," a Cheong Wa Dae official said. "There's no change in that position."